PERSIAN GULF, Aug. 7, 2017 — Flight deck operations on an aircraft carrier have often been compared to a ballet. Sailors at work on a flight deck wear an assortment of colored jerseys to specify their job. Note The top U.S. Navy photo taken by Petty officer 3rd Class Ian Kinkead is of Petty Officer 3rd Class Melanie Cluck, an aviation boatswain's mate and yellow shirt aboard the USS Nimitz in the Persian Gulf on August. 4, 2017. 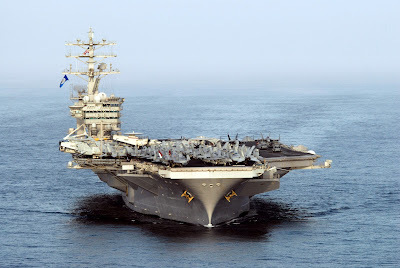 The middle U.S. Navy photo is of the USS Nimitz at sea. The above photo taken by Kinkead show Navy Seaman Michael Lathrop, an aviation boatswain's mate and blue shirt.